The earliest depictions are on Irish stonecarvings. 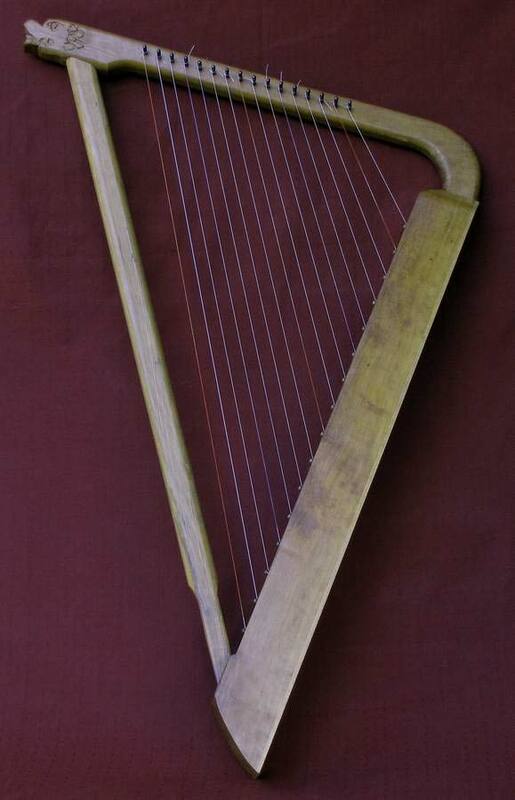 These early triangular frame harps would have usually somewhere between nine and sixteen strings, and were light and small enough to carry but large enough to have some acoustic presence. The straight arm design had it's drawbacks, but usually this design favored the middle range. The ends of the arm were often designed with zoomorphic or caricature heads or sometimes natural motifs like thistles or flowers. This is a large Irish bardic harp, sixteen strings, can be strung with gut or nylon. 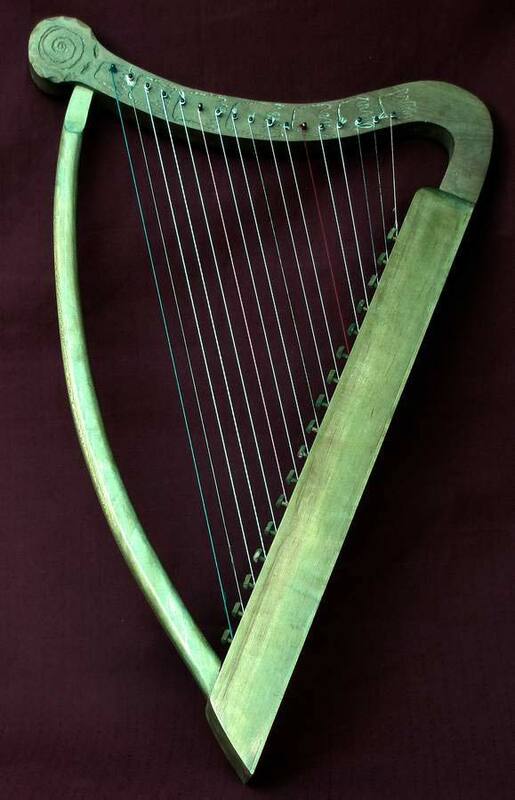 Another common term for this small and well developed harp is Romanesque. Like the Gothic, it has nothing to do with the Roman period, but the general construction and visual cues are similar to Roman designs - visually heavy, large and robust. But the harp itself is very portable and easy to carry, and the introduction of the curved arch evens out the string tension between strings and lowers the overall tension the instrument must bear. This allowed for lighter soundboards that could project better, thus a louder instrument. This example has 16 silk strings and is fitted with bray pins. It is ornamented with primitive Celtic astrological symbols. Wales was long known for it's independence, it's strong will and unique hospitality. So well known of course that the English, not wishing to be overshadowed by this hospitality and spirit of cooperation, often found themselves at odds with the Welsh. During these times the travelling Welsh bard was quite busy, travelling and meeting secretly, keeping high the friendly spirits of the Welsh, inspiring thoughts of friendly pranks and relatively harmless hi jinx toward their English brothers. This, the harp of the shining black horsehair, was their tool of choice (it was also well known for beautiful music, but where's the story in that?). The English, being who they have always been, often took measures to subdue these cheerleaders, not enjoying the antics nearly as much as the Welsh. 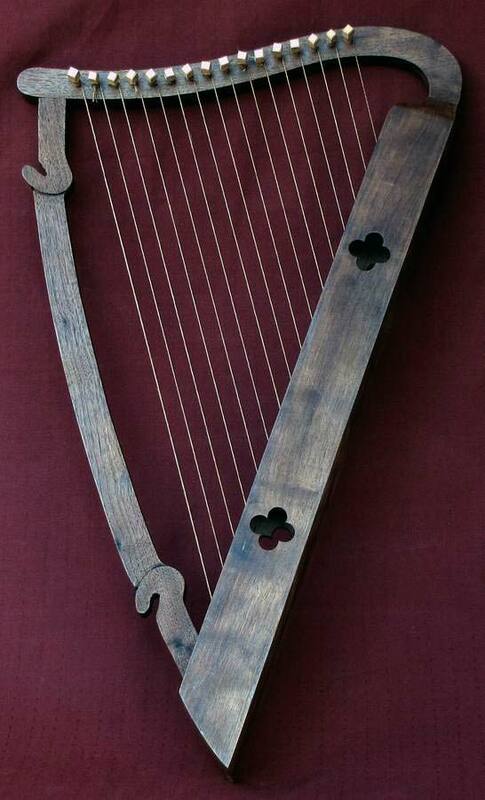 This instrument, unique among harps, held such value for the Welsh that it was often part of bride-price negotiations, and the English Crowns were so enthralled with the instrument that they often offered high reward for any used by these bards that could be added to their collection. This example has 16 horsehair strings, is made of dark walnut, with wooden tuning pegs. It is difficult to keep in tune due to the nature of the strings being hair, the most environmentally unstable string material. It can be fitted with bray pins. It is a very, very light harp, not loud but with an unmistakable and utterly unique sound.